Maki is a brand new liveaboard launched mid of May 2018. With more living areas than any other boats of its category, everyone will find its one space to relax and rest during the cruise. Maki is one of the best value for money on the market. Its deck length of 26 m and 6 m wide, Maki offers huge amount of space for all its passengers on the 3 different decks. Living areas are really what the boat was designed for in order to provide this feeling of space and freedom aboard. 4 double bed cabins, 2 upper decks with sun decks, sofa and huge mattress will suit everyone to enjoy amazing vacation aboard Maki. Land and water activities will be proposed by its fantastic crew so you can discover and learn more about the area you are sailing in! One English speaking guide onboard will make sure you have everything onboard and will choose the best place to visit and when to go to make your stay aboard Maki unforgettable. 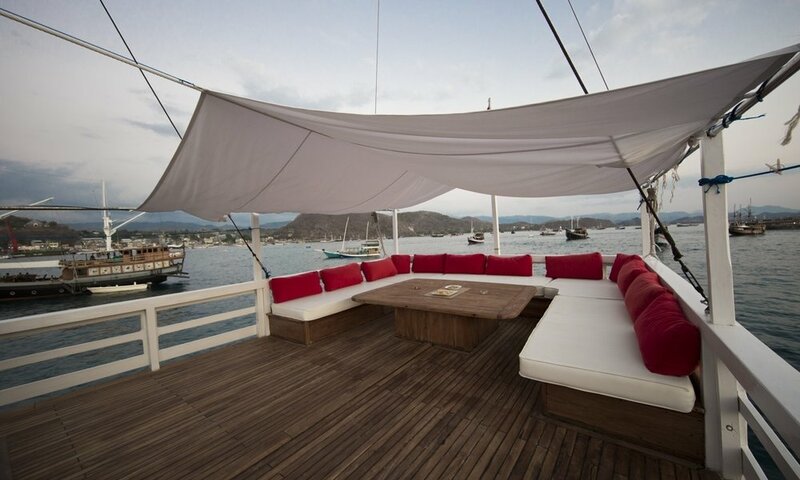 Maki has 4 very nice private cabins located on the 2 upper decks of the boat. There is one master cabin with a private balcony and bigger space. All cabins come with ensuite bathrooms, wardrobe, double bed and Air Conditioning for maximum comfort. Maki was designed to provide maximum space and comfort to its passengers. That is why the owner decided to do only 4 cabins for a maximum of 8 passengers onboard. Space, quality of service and custom cruise are what Maki is designed for. The very experienced chef will cook amazing fresh food from the local market influenced by Asian and Western cultures. You will also have the chance to learn how to cook some local dishes with the chef and bring some recipes back home. Its professional and very discreet crew will remain at your disposal to make you stay aboard Maki unforgettable. Maki has 2 sea kayaks and 2 stand up paddles so you can go and explore the nearby shore line all by yourself in total silence.